I have introduced a couple "Captain Tsubasa" entries this year, and some of you may wonder "what the hell?" In all honesty, I have never read a Captain Tsubasa comic. But I remember my younger brother did when he was in grade school. He bought all the comics, he even filled pages of notebooks with his own attempts at drawing Tsubasa characters. And most of all, it influenced him to choose football as his afterschool sports of choice. It was a tremendous cultural phenomenon back in those days among Japanese children. You must remember, this was all back when Japan didn't even have a very clear idea of football, before the J-league, before we as a country could even dream of assuming to participate in the World Cup. I mentioned in earlier entries, a few instances of where the fantasy world of Tsubasa intersected with the real world of football. The first time, it was a brief aside, mentioning that the creator of the comic, when asked a few years ago, who he imagines is the closest to fitting into the Tsubasa character. 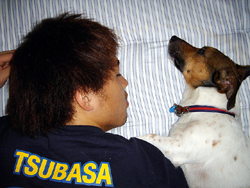 He said it was Shinji Ono (pictured sleeping next to his dog Chocolat in a Tsubasa tee) if he played at Barcelona. This was a while ago, so I'm not sure if he still would answer in the same way. The second time was to show how Captain Tsubasa has successfully gotten exported worldwide. 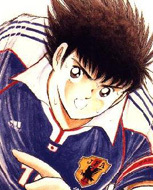 The France league's Grenoble football team mascot is based on the Captain Tsubasa comic characters, and I also mentioned that various famous European players (like Zidane and I think Totti) have shared they were influenced by Tsubasa as children. In a recent interview, Daisuke Matsui said that his ideal is still defined by the limitless sense of inspiration and creativity displayed in the Tsubasa comics. And when I saw a very old photo of Japan goalkeeper Narazaki as a young boy, he was dressed in the black long-legged long-sleeved outfit with the cap, just like Tsubasa goalkeeper Wakabayashi -- despite the mid-summer heat (as did my brother, who was the GK at his school when he was a boy, and I used to tease him about copying a comic character). Wakabayashi was by far the "coolest" (kakko-ii) member of the team... The "golden midfield" that we know in today's Japan NT, players like Nakata et al are considered the generation of Japanese footballers who read the comics in its heyday and grew up to lead our national team. We are continuing to see the aftereffects. Those same kids who grew up reading the comics til the pages were worn have now grown up into young mothers and fathers. But it was still a little suprising to see the first names "Tsubasa" and "Misaki" among the list of the real life current U-14 National team. The U-14 is in Korea right now training and playing a few local friendlies. In the comics, the full name was Tsubasa Ohzora (Tsubasa means "wings" and Ohzora means "big/great sky"). It is a rare name to see in real life, and I would say that anyone who names their kids Tsubasa is aware of its immediate correlation with the comic character. 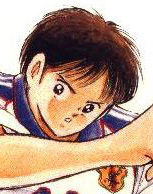 The character Misaki's full name is Taro Misaki, but in the comics he went as "Misaki", his last name. And here again, it is quite pointed to name your boy Misaki as a first name. You almost can't help but immediately connect it to the comics. He was known as the character with a pure and straight nature, so perhaps the hope was that their baby boy would grow up to have the same kind of purity and openness of heart. With such names, the two actual boys in question, Tsubasa Yamasaki and Misaki Uemura (both born in 1991), must get a lot of curious comic-related questions or teasing. And the fact that there are two players now on the U-14 team with the Captain Tsubasa-related names is probably what is most interesting. It does make one expect to see amazing plays and shots, the kind you only see in the...well, world of comics. They obviously show promise, otherwise they would not have been chosen as part of the JFA Elite Development Program. But they are two of twenty, so I guess the important thing is for all these kids to get as much opportunity to play and learn. RYO ISHIZAKI　tought me what own goal means...IT　WAS　VERY　SHOCKING　SCEAN.